According to Emporis, there are 1,223 skyscrapers in Hong Kong, which puts the city at the top of world rankings. It has more buildings higher than 500 ft (or 150m) than any other city. 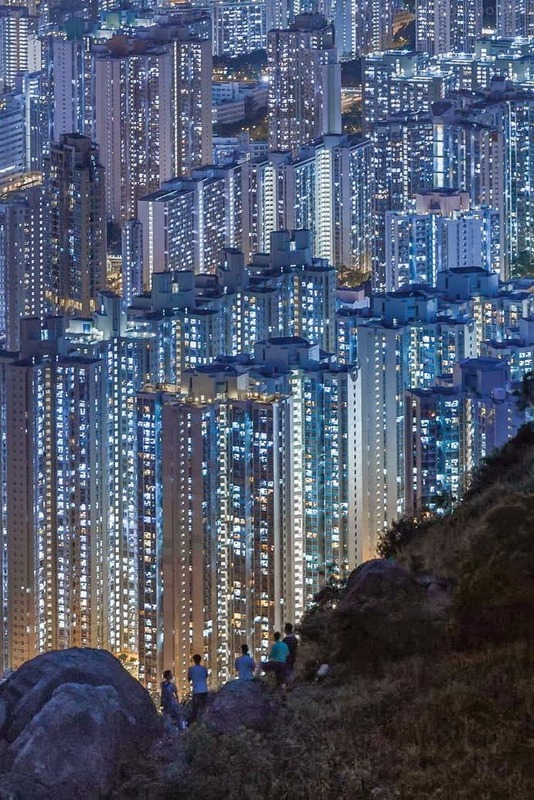 The high density and tall skyline of Hong Kong's urban area is due to a lack of available sprawl space, with the average distance from the harbour front to the steep hills of Hong Kong Island at1.3 km (0.81 mi), much of it reclaimed land. This lack of space causes demand for dense, high-rise offices and housing. Thirty-six of the world's 100 tallest residential buildings are in Hong Kong. More people in Hong Kong live or work above the 14th floor than anywhere else on Earth, making it the world's most vertical city. As a result of the lack of space and demand for construction, few older buildings remain, and the city is becoming a centre for modern architecture. The International Commerce Centre (ICC), at 484 m (1,588 ft) high, is the tallest building in Hong Kong and the third tallest in the world, by height to roof measurement. The tallest building prior to the ICC is Two International Finance Centre, at 415 m (1,362 ft) high. Other recognisable skyline features include the HSBC Headquarters Building, the triangular-topped Central Plaza with its pyramid-shaped spire, The Centerwith its night-time multi-coloured neon light show; A Symphony of Lights and I. M. Pei's Bank of China Tower with its sharp, angular façade. According to the Emporis website, the city skyline has the biggest visual impact of all world cities. Also, Hong Kong's skyline is often regarded to be the best in the world, with the surrounding mountains and Victoria Harbour complementing the skyscrapers. Most of the oldest remaining historic structures, including the Tsim Sha Tsui Clock Tower, the Central Police Station, and the remains of Kowloon Walled City were constructed during the 19th and early 20th centuries.